Searchbent.com is the PUP that uses misleading techniques to prevent removal. Use Reimage to locate malicious components and get rid of them faster than with uninstall instructions. A full system scan blocks virus reappearance and prevents traffic to malicious domains. How should you treat searchbent.com? How quickly can I remove searchbent.com? 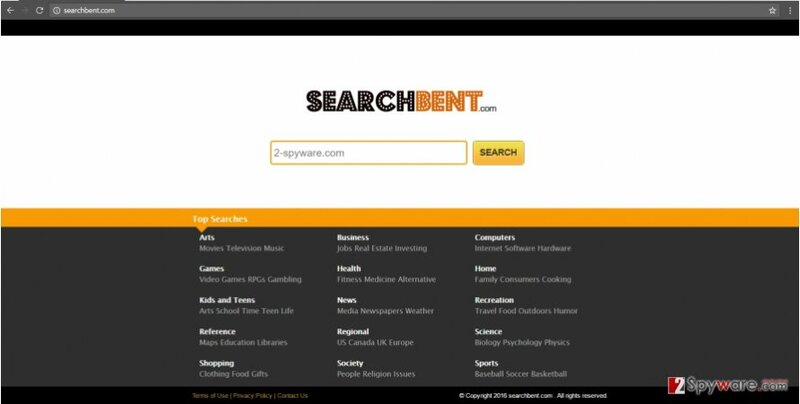 Searchbent.com virus may look like a search engine. However, it does not require any specific analysis to notice its features of a browser hijacker. After you get redirected to this domain, you see that it completely fails as a reliable search engine. After you start researching any topic, you find out that it does not provide any search results at all. However, its presence should not be ignored. The infiltration of such seemingly harmless PUP reveals that there are significant flaws in your cyber security. You should remove searchbent.com right away. Reimage does that effectively. After the hijack, you might notice an increasing number of scams. Thus, there is another reason to initiate searchbent.com removal process. Though there are tons of search engines which almost do not differ from reliable search tools, this hijacker joins the group of PUPs which instantly give out their initial aim. Unfortunately, there is the number of similar hijackers as this one: newsearch2016.com, paper-search2016.com, searchonlineisa.com, etc. Their initial goal is to attract users and make them click on certain links. The developers of this virus are rather interested in receiving many user views and clicks than retaining the users. Though there is a slight possibility of searchbent.com redirect, you should not disregard this hijacker. What is more, your non-personal data along with personal details (if you provide them) may be shared with another company in the case of a merger. Surprisingly, such data transfer might occur without your direct approval. Though there are too many contradictions involving this hijacker, it may assist more serious cyber infections to hijack your device. Thus, it would be better to proceed to Search Bent elimination. If you tend to install new applications frequently, then the chances are that you enabled searchbent.com hijack accidentally after installing a new app. Due to the common tendency to rush through the settings of the installation wizard, you might have overlooked the additional program. It might have contained the executable file of the hijacker. Luckily, there are ways how you can prevent the invasion of similar PUPs. When you are about to run the installation, select “Custom” mode. Likewise, you will be able to see optional programs. Only when you are sure that no optional tools will be installed, continue with the installation procedure. The reliable and speedy method to eliminate searchbent.com virus is to run an anti-spyware application. After downloading it, update it so that the tool could preview its virus database and locate all elements of the hijacker. Usually, searchbent.com removal process does not require much time. In case, you are used to uninstalling programs on your own; you might lean towards the manual elimination method. In order to remove searchbent.com effectively, you will need time and patience to go through step attentively. Lastly, you may reduce the risk of any PUP hijack if you watch for additional tools while installing a new program. User reviews often reveal valuable tips as well. Here, look for Searchbent.com or any other recently installed suspicious programs. Wait until you see Applications folder and look for Searchbent.com or any other suspicious programs on it. Now right click on every of such entries and select Move to Trash. When in the new window, check Delete personal settings and select Reset again to complete Searchbent.com removal. Once these steps are finished, Searchbent.com should be removed from your Microsoft Edge browser. After implementing these steps, all elements of the hijacker will be eliminated and you will be able to use the former search engine again. Here, select Searchbent.com and other questionable plugins. Click Remove to delete these entries. Now you will see Reset Firefox to its default state message with Reset Firefox button. Click this button for several times and complete Searchbent.com removal. Here, select Searchbent.com and other malicious plugins and select trash icon to delete these entries. Click Reset to confirm this action and complete Searchbent.com removal. Here, select Extensions and look for Searchbent.com or other suspicious entries. Click on the Uninstall button to get rid each of them. Here, look at the Homepage field. If it was altered by Searchbent.com, remove unwanted link and enter the one that you want to use for your searches. Remember to include the "http://" before typing in the address of the page. Now you will see a detailed dialog window filled with reset options. All of those options are usually checked, but you can specify which of them you want to reset. Click the Reset button to complete Searchbent.com removal process. This entry was posted on 2016-11-07 at 05:07 and is filed under Browser addons, Viruses. You can quickly scan the QR code with your mobile device and have Searchbent.com virus manual removal instructions right in your pocket. How did you remove Searchbent.com virus?